Brows frame a person’s face. Without a right set of brows, a person could look untidy, tired, or even suspicious. No seriously. You know how first impression counts no matter what people say. So even though i'm super minimalist when it comes to dolling up, the 2 things i cannot live without are my concealer and my eyebrow powder. I'm sure you girls would understand like how you'd get bad hair days, or bad clothes days, or bad shoes days, there are also bad brows days. Sometimes no matter how you draw your brows, they just don't go on right and it leaves you all messed up for the rest of the day. So to combat that issue, i decided to give eyebrow embroidery a go. Say hello to my new brows! No i'm kidding. I would never go out like that! This is the first step of my eyebrow embroidery experience at Allure Beauty. I decided to give them a shot after reading the good reviews online! The numbing cream is applied immediately so that it'll take effect once you decide on the brow service and shape you want. After comparing the various pictures of the brows on actual customers, of course i went for the Signature brow. Shorter strokes are used and the strokes follow the natural grain of your eyebrows, thus giving it a more natural look. The Angelic Eyebrow is for those who need some help with hair growth. 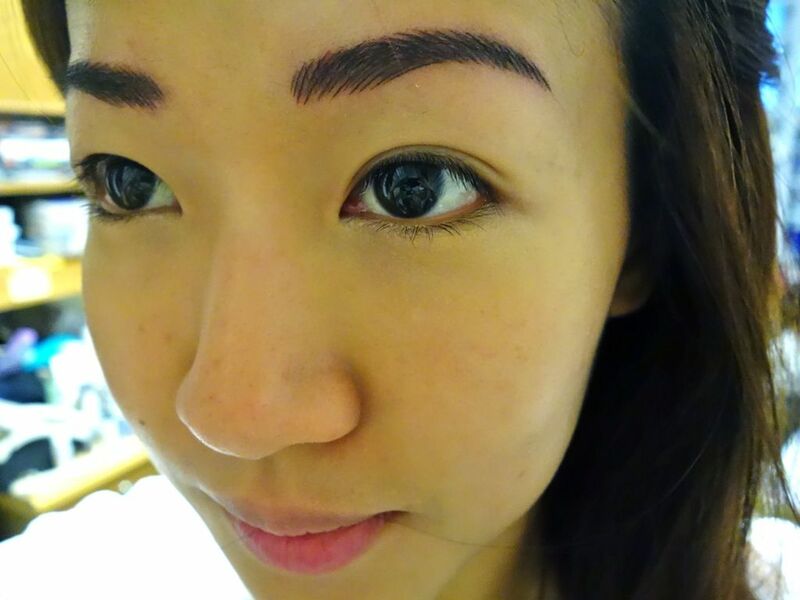 Before the actual embroidery, the therapist would shape your brows first and then pencil in the ideal shape. It's all based on the Da Vinci Golden Ratio to create balance. One of the principal trainers determining the ideal length and arch for my brows. We went through several rounds of editing the shape of my brows before she was finally satisfied with her artwork. Perfectionist but I like! She showed me a natural and a slightly thicker and flatter Korean brows and I decided on the natural one. Here's a before and after picture of my brows. I have rather sparse brows which are quite thin even though I've been threading for the past couple of years. They're also quite spaced out. I was delighted to see how much fuller they are after she drew them on. No more pains with drawing my brows in a bit! A customized color will be blended according to your skin tone and hair color. Nope it's not green! Bad lighting in this picture oops. And it wouldn't turn green like tattoos do. 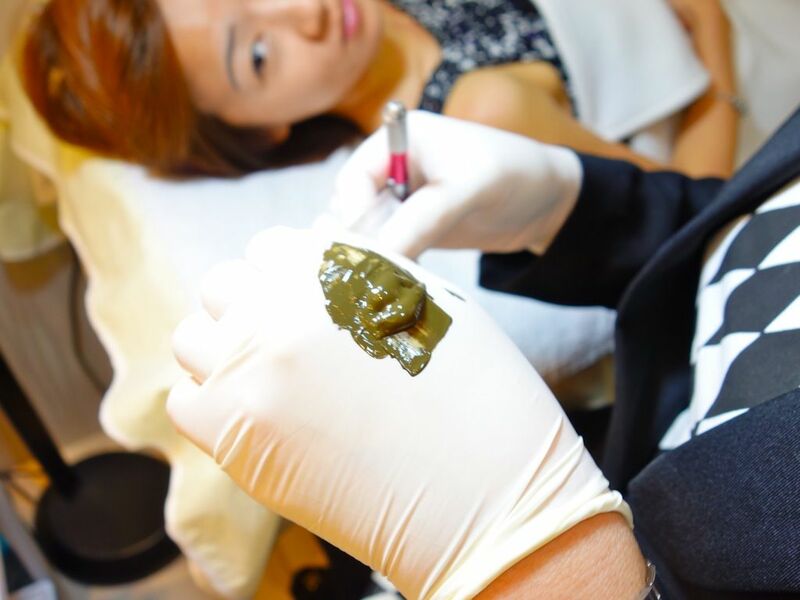 The color is inked onto the skin using a sterile blade but the cut is only on the surface area, hence it is not permanent like eyebrow tattoos. The eyebrow embroidery will last about 2-3 years typically. The good thing is that it allows for changes in shape and color to suit your current face shape. The first session took a good 3 hours because the brow expert was really particular about achieving the right shape. So we alternated between lying down and sitting and viewing from various angles and on different devices just to make sure my brows are balanced. My skin was quite sensitive for the first session so it was on the red and sore side. Am not gonna scare you with those pics. The aftercare includes waterproofing your brows for a week and application of the soothing cream when required. The paint will peel off naturally as your brows heal. Try to keep itchy fingers away, if not the color will not stay that well. How do I know? Because I had the itchy fingers and my brows didn't turn out too well. I had a patch on my left brow which was kinda empty because the color didn't stay. Boo! This is expected though as the color will only be about 50% of what was first inked. So for the first month before my touch up session, I still stuck with my eyebrow powder. 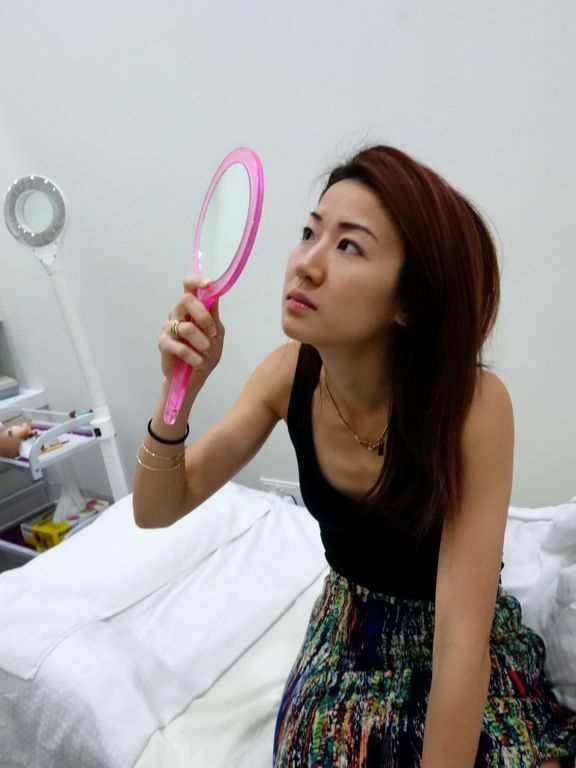 The touch up session after 1 month is necessary to make the brows darker and fuller. Thankfully the general shape remained when I visited the City Square outlet. The process was the same but this time I finished the session in less than 2h! Yay. My brows were darkened a bit more this time. A lighter color was used the first time round because the brow expert was afraid I wouldn't be used to the dark brows. 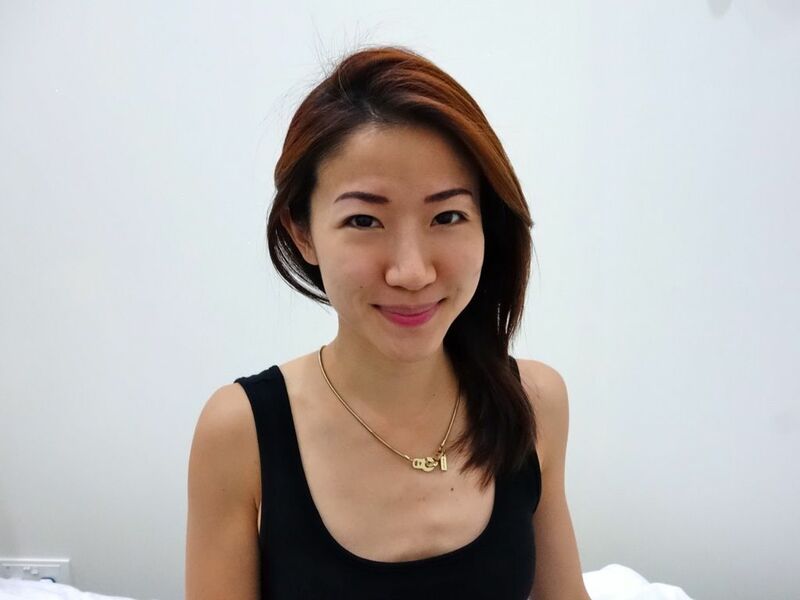 As my skin condition was a lot more stable than the first time, there was no redness at all and I loved how natural my brows were even immediately after the session. So this is the immediate after picture. Some bloody streaks but that's expected. They use blades after all. This is my day 2 pic! Love the shape! I'll update with my current eyebrow state soon but I must tell you how I absolutely love my eyebrows now. And I don't even need eyebrow powder anymore!! Now on the dollars and cents. Prices increase as you opt for more individual strokes. 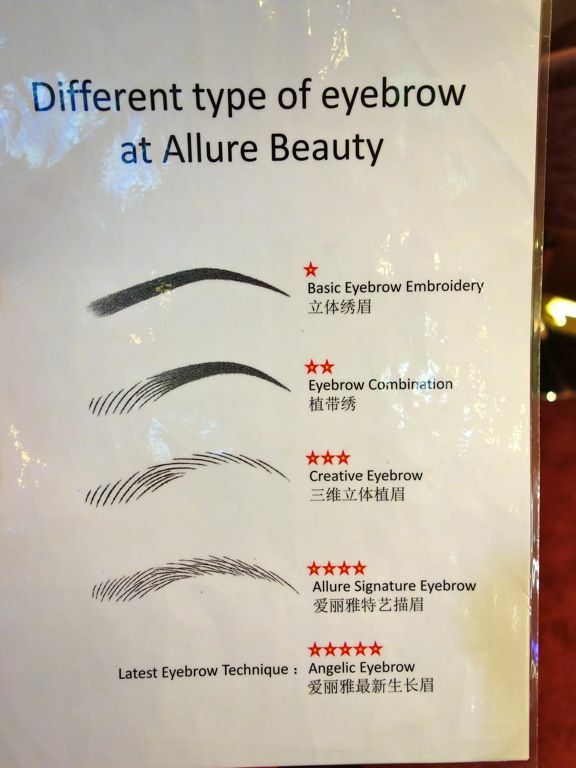 Allure's basic eyebrow packages start from $198 and so Angelic brows are the most expensive. The therapist's qualification also factors into the cost. Senior therapist price would be $1380 (before GST). This includes 2 free touch-ups (after 1 month and another after 1 year). 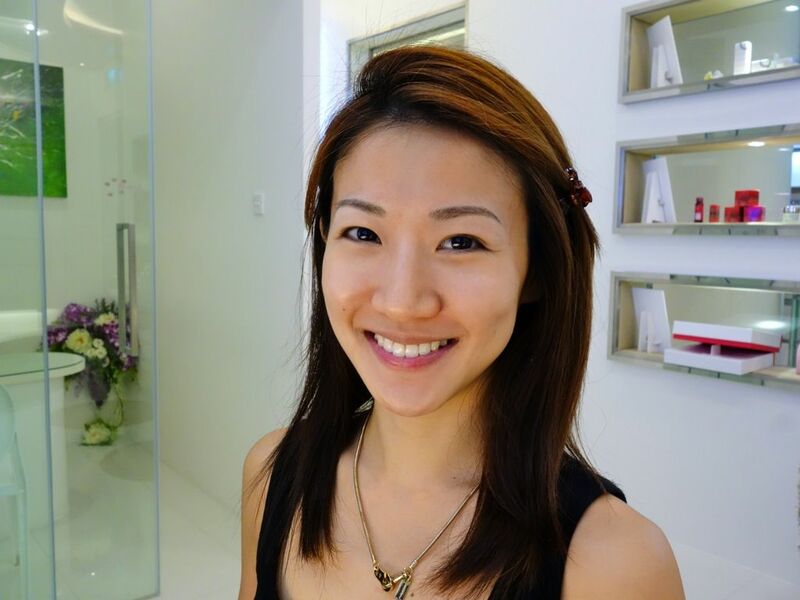 For treatment with a principal trainer, an Allure Signature Eyebrow Embroidery session would cost $1680 excluding GST. Well here's something to cushion your wallet a little! Allure is offering a $100 discount off their Signature Eyebrow Embroidery if you quote Cheryl / Ms Skinnyfat for a session with their Senior Therapists. This is valid till 9 Oct 2014. I must say that Eyebrow Embroidery is the best beauty invention ever and it's definitely worth the investment. Your new brow looks great! May I know how long did the whole procedure take and did it hurt? Thanks Michelle. :) the first session took 3h! It doesn't hurt during the session, you'll at most feel some brushing/tweeting sensation. Treat it like you would for any scraps as your aftercare procedure. Allure provides a soothing cream that should be applied daily and as required. I did Allure's Signature Eyebrow on 20 Nov. Why is my brow colour red instead of dark brown? The strokes have mostly faded already. I am due for my first month touch up in 3 weeks. Was your eyebrow this way too? My brows were still brown actually but it does fade up to like 50% before touch up. Do tell them to fix the color when you head back. Hi Jewel Blessed, how is ur brow after your first touch up? I did mine last week and felt its looked the same as before I did... so feel heart pain for that $1380 charged.